I have credit card debt I cannot pay, I do not have a job. I pray I will not be sued, or any further legal actions will occur! I ASK The Supreme Creator TO HELP ME TO HEAL ALL THE CAUSES OF MY FINANCIAL DIFFICULTIES - That I may RECEIVE THE PERMANENT FLOW OF FINANCIAL WEALTH. That I might successfully apply my creative and life skills to provide for my family,and to meet all my financial needs, TO BE BLESSED WITH PROFESSIONAL SUPPORT AND SUCCESS FOR MY Music / Decorative Arts/ and family businesses. 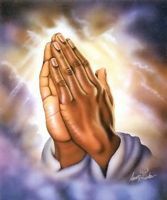 My prayers and love back to you all !!! !Thank you! F.D. I am definitely praying for you on this issue! I too, struggled with the application of my artistic talents in order to earn money to sustain myself. I prayed long, long hours on my knees for this, for many many years. In the end the Lord did hear and only now that I am an elderly person did he give me the opportunity to use what he gave me by way of talents and gifts, to use in his service. The Lord has his time and purpose for everything. I think you have to ask him to help you organize your financial life - to show you how to spend and how not to spend. Please don't make debts. We are always indebted to the one to whom we owe anything. You would rather want to be indebted to God than to the world! I know its terribly difficult to have faith in times like these, but that is exactly all God wants you to do. Tell him you are sorry for incurring debts; that you did not trust him enough when you had to spend so much, etc. etc. God is there and he is keeping watch over all of us. Trust him!